This page shows where you can get PatientView. Our How to use it page also has info on what it can do. 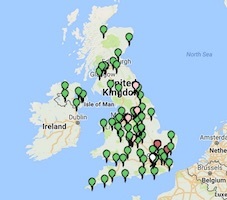 Renal (Kidney) patients: Almost all UK adult Renal Units now offer PatientView, see full list and a map here. Inflammatory Bowel Disease: Patients in Salford have been able to use MyIBD Portal to see their results and to enter symptoms since 2013. This is a version of PatientView that has now been fully merged, and it is planned to extend this service to centres in Scotland and elsewhere. The charity Crohns and Colitis UK have made this possible. Diabetes: From August 2014 patients in Salford have been able to see info from their hospital and GP records in PatientView. It is possible to offer this more widely in PatientView 2 from 2015. This development was funded by Connecting for Health. Heart failure: In 2016 a pilot in central Scotland enrolled patients with heart failure, funded by the Scottish Government. This included a heart failure symptom scorer. Become a partner – join us as a new specialty or place. We’re ready to go. Join an existing specialty as a new unit.